This month’s column takes a behind-the-scenes look at two quite different upcoming events in April – the Curiosity Festival presented by the Toy Piano Composers and an upcoming concert by the independent pianist/improviser/composer Marilyn Lerner which while different in nature from the TPC event was also surprisingly similar to it, in some very interesting ways. There was the piano connection of course; but also the artists’ interest in combining different elements, influences and genres to create their own unique creative statements. This is certainly a theme that comes up regularly in this column, but I wasn’t necessarily expecting to find this commonality when I set out to interview both parties. Monica Pearce: Beginning early in April, the TPC’s first festival, the Curiosity Festival, aims – in the words of co-founder Monica Pearce – to “bring together three unique musical explorations that go beyond what the collective already does.” Known primarily for their chamber concerts highlighting music written by their composer members, this festival has three strikingly different components: a series of operas performed in collaboration with the Bicycle Opera Project on April 1 and 2; a sound installation at the Canadian Music Centre created by TPC member Nancy Tam on April 6 and 7; and a chamber concert on April 9 that highlights all things metal, including the presence of metal music, that genre of rock that developed in the late 60s and 70s with the rise of bands such as Led Zeppelin and Deep Purple. The TPC, now in their eighth season, began from a desire by co-founders Pearce and Chris Thornborrow to create opportunities for their music to be performed once they had completed their music studies. At the same time, Pearce acquired a used toy piano and started writing pieces for the instrument. They both agreed that calling their new collective Toy Piano Composers would be a playful and imaginative name. Although the toy piano does not always appear in all their concerts (a risk, Pearce admits, in terms of managing audiences’ expectations), they have decided to stick with a name that reflects so clearly the group’s spirit of playful adventure. The first concert of the festival, “Travelogue,” celebrates TPC’s ongoing vigorous collaboration with the Bicycle Opera Project. Bicycle Opera cycles from concert to concert as a way to make the operatic art form more relevant, intimate and accessible. Their environmentally friendly approach to travel merged with their vision of showcasing emerging talent has won them enthusiastic crowds wherever they happen to go. At the Curiosity Festival, they will be performing four operas – three composed by TPC members Pearce, Elisha Denburg and August Murphy-King, and the fourth composed by Tobin Stokes on recommendation from the Bicycle Opera directors. All four pieces include aspects of travel – from the bicycle to the space shuttle – with each work tapping into the terrain of human struggle with life’s circumstances. Playback, the sound installation by Nancy Tam at the Canadian Music Centre’s Chalmers House home, features her expertise and interest in sound art and theatre. It’s a site-specific work for ten participants at a time who will be guided around the CMC space listening over headphones hooked up to individual portable audio players. Tam’s audio walk will contain excerpts from interviews she conducted with composers across Canada, as well as recordings of Tam’s music and soundscape elements. For the interviews, composers were asked such questions as “What is Canadian music, what is your relationship to composition and to the CMC?” as well as being asked to try to remember what the Chalmers House used to look like before the renovations. The “Metal” concert includes works by TPC members Fiona Ryan, Chris Thornborrow, Bekah Simms, Daniel Brophy, Ruth Guechtal and Alex Eddington. Both Brophy and Guechtal have incorporated the metal genre influence into their overall compositional style, and this concert will give them an opportunity to let this influence become an integral part of a chamber concert. Other thematic approaches to the idea of metal include Thornborrow’s exploration of the metals of industry, Ryan’s interest in metal at a chemical level, and of course the use of metallic instruments. And, in keeping with their name, music for the toy piano will also appear on this concert. The inaugural Curiosity Festival takes its place among the other new music festivals in the city, and although not as big and well-funded as New Creations or 21C, it is the first festival coming from the younger generation of presenters, Pearce told me. As for its future, TPC will assess the impact of the festival to see if it has made a positive contribution and if so, how often to repeat it. Other future visions include recording, touring and collaborating with ensembles such as Chamber Cartel from Atlanta who also present music for the toy piano. And even though they now have a core ensemble made up of flute, clarinet, piano, percussion, piano, double bass and conductor, they are committed to remaining composer-focused, despite the various challenges such as lack of sustainable funding opportunities that this presents. Marilyn Lerner: No stranger to collaboration with a wide variety of ensembles and individual artists, pianist/composer and improviser Marilyn Lerner decided to take a leap into solo performance for her upcoming concert at Gallery 345 on April 16. For those not familiar with Lerner’s music, she has created her own unique and dynamic blend from a variety of influences, the most central ones being jazz, free improvisation, contemporary classical and klezmer. Within her current ensemble, The Ugly Beauties, with cellist Matt Brubeck and drummer Nick Fraser, she is able to navigate these various genres and bring a compositional style that combines the notated with the improvised. This way of working is in fact, she says, a genre unto itself, with the main question being “How do we get from one composed section to another?” That’s where the improvisation kicks in. The art of lieder combined with Yiddish poetry is another love of hers and has been behind her collaborations with singers such as Toronto’s David Wall and New Yorker Adrienne Cooper. So what to expect on April 16? I suspect it will be a fine blended soup of all of it. In our interview, Lerner told me her plan is to pull out many pieces she has previously written but which haven’t yet been performed. “I love harmony, and even though I play a lot of improvised and free music, this side of me doesn’t get to come out of the closet. I’ve written a lot of beautiful songs, and would like a chance to play them, as this seems truer to my own sensibilities.” She used the phrase “abstract lyricism” to define her approach, with an interest in an unfolding, restless harmony much like that which you find in the music of Wagner and Strauss. Influences from French impressionists Ravel and Debussy also find their way in there, as well as her love of playing Bach. New Music Concerts concludes its busy season on Apr 24 with “Flutes Galore,” a concert featuring 24 flute players performing several works and premieres by Canadian composers. NMC artistic director and flutist, Robert Aitken, has three works on the program, including the world premiere of his latest work Caracas. Other world premieres include Impulse, a NMC commission by Alex Pauk and Two Fancies by Robert W. Stevenson. Works by Bruce Mather and Christopher Butterfield complete the extravaganza concert in what promises to be a unique sound event with the presence of multiple flutes on stage. Kitchener-Waterloo: This year marks the 40th anniversary of the music faculty at Wilfrid Laurier University in Waterloo and the new music organization NUMUS is celebrating this milestone with orchestral concerts on Apr 2 and 3 featuring world premieres by Stephanie Martin and Glenn Buhr. In their Apr 23 concert, SlowPitchSound presents his hypnotic rhythms and unconventional uses of the turntable as an instrument in conjunction with cinematic images and the movements of modern dancer Lybido. Also in the area, Ensemble Made in Canada performs works by Canadians Omar Daniel, Apr 8, and John Burge, Apr 9, for the Kitchener-Waterloo Chamber Music Society. The Music Gallery presents “Emergents III” on Apr 8 in a show curated by Alex Samaras. The program begins with a set by the duo The Science of What? with Jessica Chen and Justin Orok performing improvisations and deconstructions of popular song. The second set presents the music of Jeremy Bellaviti, an emerging composer whose style merges contemporary classical with the rhythmical influences of folk music. The concert will also feature the premiere of his new work for violinist Sarah Fraser-Raff. Arraymusic’s Apr 5 concert, “Four New Works,” presents world premieres by Anna Höstman, Gregory Newsome, Adam Scime and Scott Wilson, with guest soprano Carla Huhtanen. Continuum is heading west in April for a tour of British Columbia in collaboration with Ballet Kelowna and four choregraphers. Reimagined Renaissance Music is the theme that will be explored musically in works by Rodney Sharman, Jocelyn Morlock and Michael Oesterle. Toronto audiences will have the chance to see and hear this show in the fall. 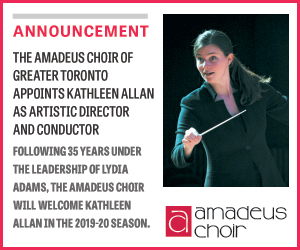 Apr 7: Women’s Musical Club of Toronto. Commissioned premiere by Zosha di Castri. Apr 8: Essential Opera. Several contemporary operas, each focused on a different facet of women’s lives featuring composers Leslie Uyeda, Anna Pidgorna, Anna Höstman, Fiona Ryan, Elizabeth Raum, John Estacio and Jake Heggie. Apr 23: mmmm Composers In Concert. New works by Michel Allard, Marco Burak, Michael Dobinson and Michelle Wells. Stratford. Apr 27: Canadian Music Centre. Three commissions of Canadian works by Katarina Curcin, Nicole Lizée and Kati Agócs performed by the Cecilia String Quartet. April 28 and 30: Toronto Symphony. towards Osiris (2005) by German composer Matthias Pintscher.